The Spin Doc concept is to meet the challenges of the client with an integrated product development process that ultimately brings together the design concept and vision with the more pragmatic view of the engineers. We can do this because we have a staff of skilled team workers with all the qualifications necessary to go through the motions of the product development process housed under one roof. You may hire us as individually in-house consultants or as an external extension of your own company's R&D - we have a solution that meets most needs. The range of products spans from undertaking an entire project development process to catering for our customers' demand for outsourcing single services in the development process. All product development work takes place in close cooperation with the client, who can monitor and challenge every step in the running process. We know what we're good at, but we also know that the client's particular know-how will always be the basis on which we operate. Our first core competence area is giving the product a shape that shows the beauty and credibility of its function. Of course, industrial design is only one part of the chain of development that leads to a good product. But it's the part that can make or break the whole thing. The design effort may be only skin deep, but it's the outer skin of the product that has to communicate the marketing values and technical features that sell it. That is where design comes in: At the point of sale. Whether it's about the consumer's impulsive shopping decision or the professional's careful consideration, good design can make the difference between sale and no sale. Getting the concept right is the first stage of the design process. There is an unlimited number of solutions to any design assignment, but only one that is right for the client's market. We know how important it is to find that solution early in the development process, and we have the tools that will bring us there. Behind every successful product there is a large number of concepts that don't make it to the market. Those are the concepts we generate in order to give our clients the opportunity to choose the concept they believe in, supported by our experience in developing the chosen concept into a finished design that hits the market in the right place and at the right time. Developing products is one thing. Creating the graphics for those products is another. As product developers, we find it natural to work in this field as an extension of our industrial design work. No product is complete without the graphics that surround it and the packaging it comes in, and working on those aspects of the design is an obvious way to enhance the product's expression. What it is all about is creating a coherent visual identity for the company and its products that makes both easily recognizable in a crowded marketplace. We believe that the best results come when graphic identity goes hand in hand with product design. With computerized products, a vital part of the user's interaction with the product takes place onscreen. Today, users expect to be met by a graphic user interface which corresponds in quality to the highly developed interfaces they have become familiar with through Windows, Mac OS, Linux etc. 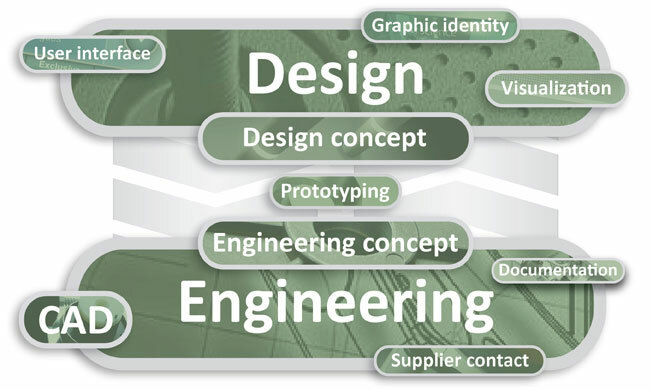 This is not an easy task to fulfill, but by cooperating with skilled programmers and using our broad knowledge of designing user-friendly physical products, we offer our clients the possibility of extending the product development process to including a well-designed, self-explanatory graphic user interface to their products. Making renderings and animations is an integrated part of our daily CAD work process. However, we also offer visualization as an individual service performed without connection to a design project. Over the years, we have made visualizations for a variety of different purposes ranging from large-screen fair presentations to internal marketing DVDs and user surveys. In the medical field we have created animations of medical devices used by our clients to evaluate user reactions to various proposals for new devices. This can be a very cost-efficient and fast alternative to user test models. We use a number of different prototyping techniques to create various kinds of models throughout the product development process. For design purposes, we will make visual models in modeling foam or CibaTool using our in-house CAM milling machine or use one of our rapid prototyping subcontractors. In the engineering phase, we will make quick mock-up models in our own workshop to test concepts, or use rapid prototyping subcontractors to make SLA or SLS models to test detail solutions in the later parts of the engineering process. Our other core competence area is mechanical engineering. We are proud to say that we have some of the most experienced and versatile engineers in the country, familiar with solving a large number of different tasks. Our team of engineers master all important phases of the mechanical engineering process, from material selection and design for manufacture to strength and structural analysis and design of mechanisms. Paying close attention to the development within mechanical engineering, our engineers keep on pushing the barriers for what can be done and how cost-efficiently a product can be made. At the end of the development process comes the to deliver documentation corresponding to the needs of the particular project in terms of tolerances and detailing specifications. We deliver the final documentation using industry standard software such as Pro/ENGINEER and Solid Works and use specific standards like GPS if this is required. The documentation we deliver is of a quality which can be forwarded directly to the subcontractor for manufacture, including the necessary tolerances and other agreed specifications. The experience, versatility and skills of our engineers makes it possible to quickly generate a wide range of engineering concepts using the most recent and efficient methods of idea generation. We often do this in working groups consisting of engineers and designers with different background. Not only do we develop engineering concepts in the early phases of the development process, but we are also able to organize the early concepts and then select more detailed engineering concepts as well as building mock-ups and of these and using them to test the concept. We are in contact with a significant number of national and international subcontractors. This puts us in a good position to find the right producer and technology for clients who wish to outsource the production or companies not having production machinery with the desired technology at their disposal. We have had good experiences with toolmakers and producers in the Far East, mainly China. Obviously, it is not without complications to transfer the production to the other side of the World compared to using a local subcontractor. But when the demands for quality and tolerances correspond to a Far East level, substantial savings can be made on tooling and unit costs.